What was was ever, and ever shall be. So then it is eternal and infinite and one and all alike. [N]othing is stronger than true reality. 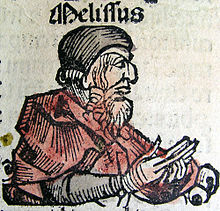 Melissus of Samos (Greek: Μέλισσος; fl. fifth century BC) was an ancient Greek philosopher, the third and last member of the ancient school of Eleatic philosophy, whose other members included Zeno and Parmenides. Translated 1920 by John Burnet. ᾿ἀεὶ ἦν ὅ τι ἦν καὶ ἀεὶ ἔσται. Εἰ γὰρ ἐγένετο, ἀναγκαῖόν ἐστι πρὶν γενέσθαι εἶναι μηδέν· εἰ τοίνυν μηδὲν ἦν, οὐδαμὰ ἂν γένοιτο οὐδὲν ἐκ μηδενός᾿. What was was ever, and ever shall be. For, if it had come into being, it needs must have been nothing before it came into being. Now, if it were nothing, in no wise could anything have arisen out of nothing. Οὕτως οὖν ἀίδιόν ἐστι καὶ ἄπειρον καὶ ἓν καὶ ὅμοιον πᾶν. Οὐδ᾿ ἂν τὸ ὑγιὲς ἀλγῆσαι δύναιτο· ἀπὸ γὰρ ἂν ὄλοιτο τὸ ὑγιὲς καὶ τὸ ἐόν, τὸ δὲ οὐκ ἐὸν γένοιτο. Καὶ περὶ τοῦ ἀνιᾶσθαι ὡυτὸς λόγος τῶι ἀλγέοντι. Οὐδὲ κενεόν ἐστιν οὐδέν· τὸ γὰρ κενεὸν οὐδέν ἐστιν· οὐκ ἂν οὖν εἴη τό γε μηδέν. Οὐδὲ κινεῖται· ὑποχωρῆσαι γὰρ οὐκ ἔχει οὐδαμῆι, ἀλλὰ πλέων ἐστίν. Εἰ μὲν γὰρ κενεὸν ἦν, ὑπεχώρει ἂν εἰς τὸ κενόν· κενοῦ δὲ μὴ ἐόντος οὐκ ἔχει ὅκηι ὑποχωρήσει. Τοῦ γὰρ ἐόντος ἀληθινοῦ κρεῖσσον οὐδέν. …nothing is stronger than true reality. This is indeed the first question we have to ask: is generation a fact or not? Earlier speculation was at variance both with itself and with the views here put forward as to the true answer to this question. Some removed generation and destruction from the world altogether. Nothing that is, they said, is generated or destroyed, and our conviction to the contrary is an illusion. So maintained the school of Melissus and Parmenides. But however excellent their theories may otherwise be, anyhow they cannot be held to speak as students of nature. There may be things not subject to generation or any kind of movement, but if so they belong to another and a higher inquiry than the study of nature. They, however, had no idea of any form of being other than the substance of things perceived; and when they saw, what no one previously had seen, that there could be no knowledge or wisdom without some such unchanging entities, they naturally transferred what was true of them to things perceived. Aristotle, Part 1 of On the Heavens Book III (350 B.C.E. ), translated by John Leofric Stocks. [W]hen in company where people engaged themselves in what are commonly thought the liberal and elegant amusements, he was obliged to defend himself against the observations of those who considered themselves highly accomplished, by the somewhat arrogant retort, that he certainly could not make use of any stringed instrument, could only, were a small and obscure city put into his hands, make it great and glorious. Notwithstanding this, Stesimbrotus says that Themistocles was a hearer of Anaxagoras, and that he studied natural philosophy under Melissus, contrary to chronology; for Melissus commanded the Samians in their siege by Pericles, who was much Themistocles's junior; and with Pericles, also, Anaxagoras was intimate. Plutarch, Life of Themistocles, translated 1683 by John Dryden and other eminent hands. Together with his victory and pursuit, having made himself master of the port, he laid siege to the Samians, and blocked them up, who yet, one way or another, still ventured to make sallies, and fight under the city walls. But after that another greater fleet from Athens was arrived, and that the Samians were now shut up with a close leaguer on every side, Pericles, taking with him sixty galleys, sailed out into the main sea, with the intention, as most authors give the account, to meet a squadron of Phoenician ships that were coming for the Samians' relief, and to fight them at as great distance as could be from the island; but, as Stesimbrotus says, with a design of putting over to Cyprus, which does not seem to be probable. But, whichever of the two was his intention, it seems to have been a miscalculation. For on his departure, Melissus, the son of Ithagenes, a philosopher, being at that time the general in Samos, despising either the small number of the ships that were left or the inexperience of the commanders, prevailed with the citizens to attack the Athenians. And the Samians having won the battle, and taken several of the men prisoners, and disabled several of the ships, were masters of the sea, and brought into port all necessaries they wanted for the war, which they had not before. Aristotle says, too, that Pericles had been once before this worsted by this Melissus in a sea-fight. … Pericles, as soon as news was brought him of the disaster that had befallen his army, made all the haste he could to come in to their relief, and having defeated Melissus, who bore up against him, and put the enemy to flight, he immediately proceeded to hem them in with a wall, resolving to master them and take the town, rather with some cost and time than with the wounds and hazards of his citizens. Plutarch, Life of Pericles XXVI–XXVII, translated 1683 by John Dryden and other eminent hands. Melissus, the son of Ithaegenes, was a native of Samos. He was a pupil of Parmenides. Moreover he came into relations with Heraclitus, on which occasion the latter was introduced by him to the Ephesians, who did not know him, as Democritus was to the citizens of Abdera by Hippocrates. He took part also in politics and won the approval of his countrymen, and for this reason he was elected admiral and won more admiration than ever through his own merit. Diogenes Laërtius, §24 of Lives and Opinions of Eminent Philosophers Book IX, translated by Robert Drew Hicks. Melissus seems to infer that what really exists must be permanent and immutable, because it is too tough to pass away, and all change involves the destruction of a previous state of being. The argument depends upon investigating what we mean by saying something is real or exists. Permanence, Melissus suggests, is part of the concept of truth or existence. Is that so? How would we check up? Catherine Osborne, "Reality and appearance: more adventures in metaphysics", ch. 4 of Presocratic Philosophy: A Very Short Introduction (2004).